A new trading entry between Thailand and Burma was opened this week that links both countries on their southern borders. 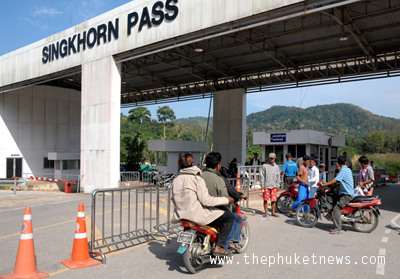 The new trade crossing links SingKhorn in Thailand’s southern provinces of Prachuap Khiri Khan with Mawhtaung a large town in Burma’s Myeik district. Senior officials from the Karen National Union joined with Burma government ministers and Thai officials at the opening ceremony. Burma’s Chief Minister for the Tanintharyi Division, U Myat Ko and Thailand’s governor of Prachuap Khiri Khan, Veera Sriwattanatrakul, conducted the opening ceremony for the trade crossing. Attending the ceremony on behalf of the Karen National Union (KNU) were the Mergui-Tavoy District leader, Brigadier General Saw Dah Kyaw Loo.